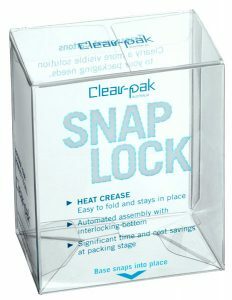 New from Clear-pak. Snap lock cartons are a great solution for longer run folding carton applications. Significant time/cost savings at the packaging stage – up to 30%. New from Clear-pak. Snap lock cartons are a great solution for longer run folding carton applications. Heated crease and cut process Automated assembly with interlocking bottom Provides for quick and easy packing Significant time/cost savings at the packaging stage – up to 30%. Minimum quantities apply.